Arugula (also known as Roka, Roquette, and Rocket) wins my garden’s miracle plant of the year award. We’ve grown arugula often over the years. We usually get a salad or two before it bolts; a common problem in Alaska. With our long days, nearly 20 hours of daylight at the solstice, many herbs and green vegetables go to seed prematurely. 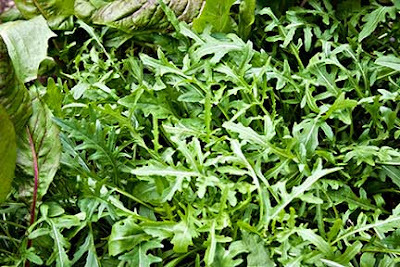 Despite its tendency to bolt, we grow arugula because we enjoy its bite in salads. Last year, the arugula followed its typical pattern: two salads at the beginning of summer and it bolted. I assumed that was it. I was wrong. This spring, after the snow melted, we noticed radicchio we’d harvested last year, but hadn’t pulled up, coming back. In the same bed, mystery plants were emerging; they had tiny green leaves growing around slender dead stalks. We had no idea what they were (I guessed domesticated Italian dandelions we grew last year in the same bed), but let them grow so we could find out. As the plants grew larger, I realized last year’s arugula had wintered over. I was initially confused, as I’d thought arugula was an annual (Eruca vesicaria subspecies sativa). Although I'd only grown annual arugula, it turns out “arugula,” actually refers to three separate plants: E. vesicaria ssp. sativa, Diplotaxis tenuifolia, and Diplotaxis muralis. Last year we planted arugula seeds brought back from Greece. When I dug out the seed packet, I discovered it was Diplotaxis tenuifola, also known as wild arugula or Selvetica, an extremely cold hardy perennial (as plants must be to survive Alaskan winters). I’m thrilled to have stumbled upon it, and will give it a permanent place in my garden. 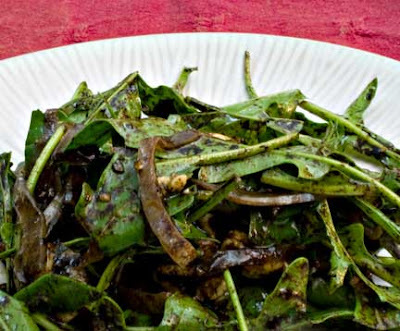 Most commonly I use arugula in mixed green salads, or on its own with blue cheese and best quality balsamic vinegar. This year the arugula was so prolific I branched out. 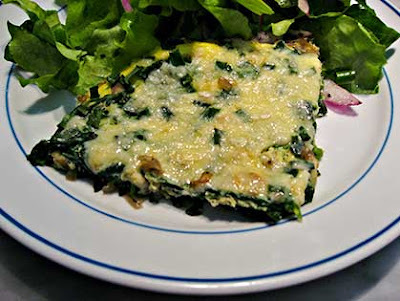 Arugula, briefly sautéed with shallots, adds a nice bite to omelets and frittatas. Mixed with tomatoes and anchovies, it makes a delicious pasta sauce. 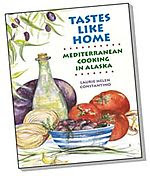 My mother, upon hearing of my arugula glut, recommended the wonderful Arugula and Tomato Salad from Carol Field’s In Nonna’s Kitchen: Recipes and Traditions from Italy’s Grandmothers. Mother was right; arugula goes really well with tomatoes. Anchovies are the secret ingredient that makes both the salad and pasta sauce special. When minced and incorporated into other ingredients, anchovies add flavor without overwhelming the taste buds. Crack the eggs in a bowl, season lightly with salt and freshly ground black pepper, and whisk to combine. Sauté the shallots, lightly seasoned with salt and freshly ground black pepper, in olive oil until they soften and start to turn golden. Add the arugula, in batches if necessary, and cook just until all the arugula has wilted. Evenly distribute the arugula in the pan and pour the eggs over. Cover and turn the heat down to low. Keep checking the eggs and when they’re almost-but-not-quite set, sprinkle the cheese and minced chives over, cover, and cook until the cheese melts. Sprinkle with freshly ground black pepper, cut into wedges, and serve. Lightly salting the tomatoes helps bring out their flavor, but be careful not to overdo as anchovies can be quite salty. I made this with the smaller amount of anchovies, but we both thought it would benefit from more; next time I’ll use the larger amount. I originally made this with whole anchovies, as shown in the picture, but we prefer the salad when the anchovies are minced in the dressing. Either way, it's tasty. Divide the tomato slices between 4 salad plates and salt lightly. Whisk the olive oil into the red wine vinegar and season with freshly ground black pepper. Mince the anchovy fillets and mix them into the dressing. Taste and add freshly ground black pepper or salt as needed. Toss the dressing and arugula (there may be leftover dressing), and mound on the tomatoes. Serve immediately. I never tire of this tasty salad. Because there are so few ingredients, it’s important to use best quality balsamic vinegar. 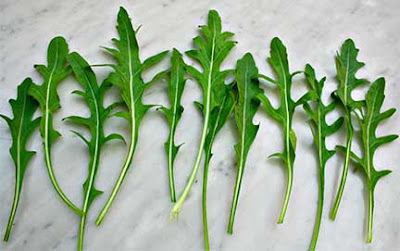 Wash and dry the arugula and tear large leaves into pieces. Add the arugula, red onion, and half the blue cheese to a salad bowl. Whisk together the olive oil, balsamic vinegar, salt, and freshly ground black pepper. Toss the dressing with the salad ingredients. Taste and add more balsamic vinegar, if needed. Sprinkle with the remaining blue cheese, grate freshly ground black pepper over the salad, and serve. This recipe calls for a large quantity of arugula, which I measured after it had been cleaned and roughly chopped. If you don’t have arugula, dandelions or other wild greens are the best substitute; the dish may also be made with radicchio, Swiss chard or spinach. Toast the pine nuts in a 350°F oven or dry frying pan. In either case, pine nuts burn easily and must be watched carefully as they cook. Onions cook more evenly when lightly salted before sautéing, however, anchovies are salty so be sure not to over-salt the onions. Cook the pasta in boiling, salted water and cook until it is al dente. Drain the pasta and toss with a little olive oil. Sauté the onions, lightly seasoned with salt and freshly ground black pepper, in olive oil until they soften and start to turn golden. Add the anchovies, garlic, and Aleppo pepper and cook for one minute. Stir in the arugula, tomatoes, and water, and cook for 3 minutes. Add the cooked pasta and green onions, and cook just until the pasta is warmed through. Toss with 1/2 cup cheese and half the pine nuts. 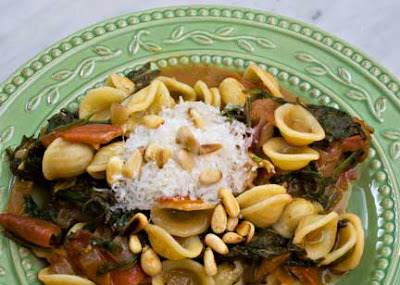 Sprinkle with the remaining cheese and pine nuts and serve immediately. This is my entry for Weekend Herb Blogging, hosted this week by Kelly from Sounding My Barbaric Gulp. Laurie,a clever "quatro-posto"...not one of the dishes has salt in it - instead each recipe uses an ingredient with ample salt in it...clever. However, you listed Fontina as a suitable sub for Kasseri...the aged Fontina is closer, no? Also, mom's know best, eh? Four recipes are better than one Laurie. Each one is perfect and you've certainly showcased what this wonderful ingredient can do. Great collection of ideas for using arugula. I've had similar problems with growing the annual version here. Have to look for this type. Great collection of arugula recipes. I so often run out of arugula ideas and sometimes eat it just by itself. 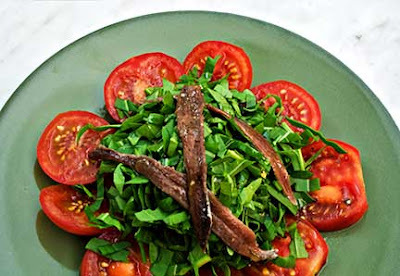 I think I love the arugula and tomato and anchovy the best. What a great collection of recipes. That egg dish looks really tasty as does the salad with the anchovies. Yum! we recently saw a documentary on alaska - it told us the same things you tell me about summer there: everything grows so quickly it turns seedy before you've had your fill of it. I love these recipes that you've posted, I'll keep this page book marked for winter, what great ideas! oh, i adore arugula and these are great uses. Laurieeeeeeee!!!! Once you start you cannot stop ;D. Wow, which one could I pick first? Not the cheese one, but the rest look heavenly... I should buy some rocket first, though! Wanna party? Come for a drink in my blog guapa! Peter M, "quatro posto" - I like it! As for kasseri and fontina, I like the melting quality of both, but really any cheese you like can be used in this dish. Hank, you are assuming we ever have hot enough weather here to get that sharp flavor you're talking about. Not this year! Maria, oh queen of the pot plants, I agree completely - my favorite way is with blue cheese and balsamic. Lydia, mine didn't self seed but in your weather they no doubt will. As for fencing, we need to do it against the moose or we would not have a single plant left in our garden. Peter G, I don't know about the recipes being perfect, but they sure do taste good. Kalyn, you really should try it - we've been eating it for weeks and it still hasn't gone to seed. Eatingclub, you should definitely try the tomato and anchovy recipe - it's SO GOOD. Maria, but did they tell you about our giant cabbages?? The record is a single cabbage that weighed over 105 pounds! Cheryl, I do remember your winter garden post (and also your more recent garden bounty). Thank you for reminding me about arugula pesto - I've been meaning to try it. Nuria, better pick one that doesn't require cooking!! I dropped by your party and really had a great time - thanks for the invite! All of those arugula dishes look delicious. I especially like the addition of the anchovies in some of them. I often mince canned anchovies and add them to a tomato sauce with amazing results. The added saltiness of the anchovy works so well with the pasta...the funny thing is that you can fool someone who dislikes anchovies into eating the pasta without a mere hint that there is fish in the sauce LOL! What a nice surprise to find in one's garden! You've certainly enjoyed your unexpected bounty in delicious ways -- the eggs are our favorites, too! I love how you give an ingredient the full treatment! It all looks so good, especially the last dish. I love pasta and I love anchovies.